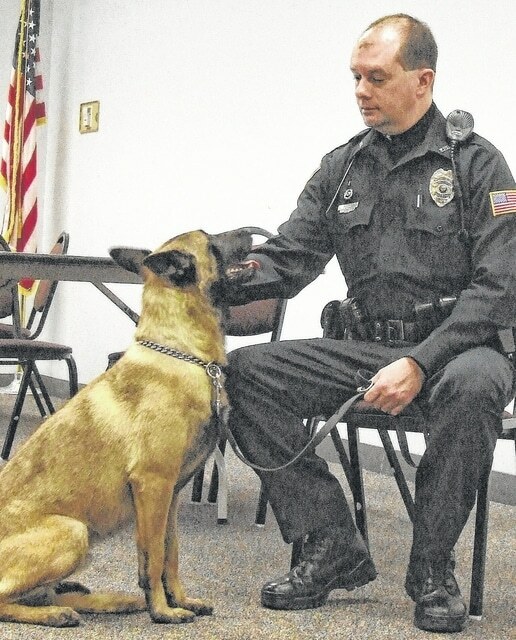 K9 Karson and his partner, Wilmington police officer Jerry Popp, await the start of a March 10, 2015 press conference at Wilmington City Hall after Karson returned to the beat as a canine member of the police department. WILMINGTON — “K9 Karson Comes Home,” a children’s book, will be released in mid-September, written by an area retired school teacher and made available by a Wilmington publishing house. The 32-page color book is filled with photographs of Karson and details of his 200-mile adventure, according to a post on Karson’s Facebook page by Wilmington police officer Jerry Popp, who is Karson’s handler. The book project has been several months in the making, Popp said Wednesday. In part, the book is “about not giving up — making sure you follow through with what’s started,” said Popp. It is targeted toward children and is meant to give them an idea of the bond between a K9 officer and their partner, Popp stated in the post. Clinton Countian Abbie Beam is the book’s author. “Orange Frazer Press is honored to be working with Abbie Beam, the city of Wilmington, chief Weyand, officer Popp and Karson on Karson’s story,” said publisher Marcy Hawley. “Karson’s been to our office many times now, not just for his photo shoot, but often just to visit and get updates on his book. He’s a gentleman, responds to commands, and has a great smile. How much better can it get? We’re very happy he made it home,” Hawley said Wednesday. The story starts from the time Karson went missing on Dec. 23, 2014, and continues to his Feb. 22, 2015 recovery and reunion. It also includes how he survived and how the community came together, Popp said. Also included is a reconstructed map of Karson’s travels during those 61 days. At a time period when there is “so much negative press on law enforcement,” the story shows how a community can combine with law enforcement “and get things done as a group,” the police officer said to the News Journal. A comment by Jackie Stanton on Karson’s Facebook page indicates she has pre-ordered three copies of the book. “I would like to donate 2 back to you, Karson & WPD. Maybe you could keep them in your cruiser and if you get a run with a distressed child you could give them the book to comfort them,” wrote Stanton.